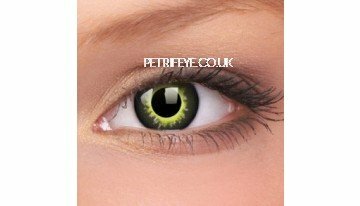 Add a splash of colour to your Halloween costume this year with Petrifeye.co.uk’s mesmerizing Halloween Spooky Contact Lenses! Petrifeye.co.ukoffer a huge range of contact lenses from Zombie Contact Lenses to Fashion Contact Lenses you’re sure to find something suitable to your tastes! Check out these hypnotic Green Abyss Contact Lenses which are truly breathe taking, as they transform your entire iris into a black void whilst supplying a burst of colour around the outer ring of the iris, you’re certainly going to get noticed whilst wearing these lenses! These contacts would work perfectly with practically any Halloween costume as they’re extremely diverse; you could wear these lenses with a vampire, werewolf or phantom costume. If you’re looking to impress these are the contact lenses to purchase! Feast your eyes upon these dramatic White Splattered Coloured Contact Lenses which look fantastic paired with a zombie Halloween costume as they make your eyes appear like they have been infected by a zombie virus- they’re truly frightening! The contrasting white and red makes your eyes look a lunatic mental patient, therefore these lenses are sure to provide a real Halloween scare! Check out these enchanting ColourVUE Eclipse Contacts which would be absolutely perfect for a witch or wizard costume as they make your eyes have a beautiful magical appearance- they’re truly spellbinding. Cast everyone you see under a spell when they see your hypnotic coloured eyes. If you want more fantastic Halloween Spooky Contact Lenses visit Petrifeye.co.uk!